His success in the last Super Bowl allowed Tom Brady to earn the title of "Greatest of All Time". In the new offshoot of the Madden series we get, among other things in a story mode, the opportunity to accompany the career of Devin Wade and his kindergarten friend Colton Cruise. Maybe we follow in the footsteps of GOAT Tom Brady? The launch in Madden NFL 18 looks a little bit unusual, in the last two years we were greeted by film-rich productions, which brought us closer to the news of the current Madden teils. Unfortunately this year mini-tutorial has been omitted. Too bad, because in Germany Football is on the rise and many beginners would be happy about this help. Arriving in the main menu, we welcome the simple but efficient tile menu, known from the previous parts. 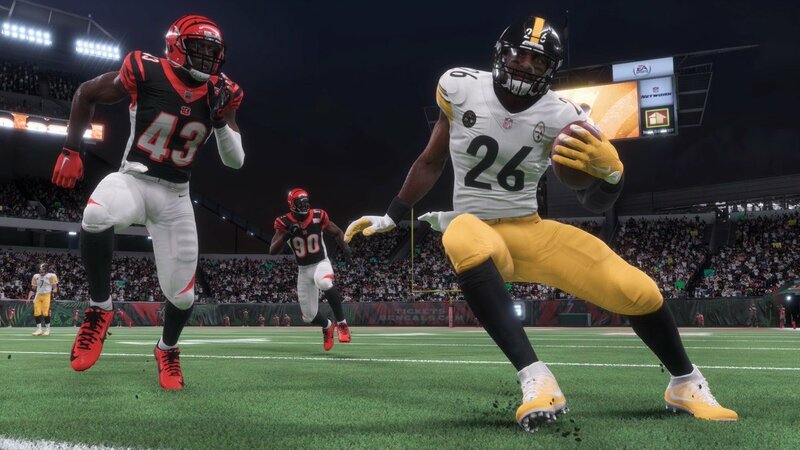 EA Sports created the Frostbite Engine for Madden 18 this season. Originally this was for Battlefield and Star Wars: Battlefront in use, meanwhile, but EA has become friends with this also in the sports segment (FIFA) to use. The new engine has a very positive effect on the players' faces, because you can see at first glance which NFL stars you are dealing with here. The details of the environment, such as The lawns are better captured and the lighting in the stadiums and the reflections on the helmets look great. In some places, the graphics seem pretty bland. There is criticism from our side for the hair on longer hair, EA is chic. Incidentally, so-called clipping errors in collisions no longer occur so often due to the engine change, but they nevertheless still occur. For example, in longshot mode I noticed some mistakes in the animations when running with the ball or an interception / recovery, and my hands disappeared every now and then. Nevertheless, a pleasant innovation, thanks Frostbite Engine. Please eliminate these errors completely in the next year! In the review of Madden NFL 17, we mentioned earlier that many players do not wear their tattoos in the game, unfortunately this has remained so until today - the reason is, presumably, copyrights of the artworks. On the negative side I noticed the loading times in normal games with NFL teams. While in the longshot mode, in principle, there are no loading times due to the cutscenes, they are even longer before playing a football game. Sometimes there was a loading time of over a minute on the Xbox One, I think that should be an absolute no-go on the current console generation. Here EA certainly needs to be optimized in the upcoming Madden part. Let's get to the heart of the game, the gameplay. The kick mechanism introduced last year is also included in Madden 18, and a good kick will naturally be a challenge, depending on the level of difficulty. There is a new game variant: the "arcade mode". This is also visualized in the HUD, so that you immediately recognize that we are in a arcade party during a game. This style of play should be especially for those who are dealing with the new Madden series. There are more action, so more spectacular catches, more fumbles etc. to keep the game arcadig / interesting. Of course, there is also the more realistic Sim mode. The Jukes, which were reintroduced in Madden 17 last year, have been upgraded and are not expected to be overpowered this year. Also on the behavior of the D-Lines was screwed, so you do not have to worry too much about what our side people in the Defense grade organize. However, this year in the Offense it often happens that you either have a lot of time through perfect blocks of your teammates - or somewhere a huge hole for the opponent results - through which he breaks through and sacked you. EA introduced Target Passing this year, a kind of manual fit. In longshot mode you will have some attempts in training to try out the new target pass. You have full control over the pass in Target Passing, you can decide where to put the ball on the route - but the implementation is difficult to master. Anyone who has ever played Madden or seen football knows how little time is left to a quarterback to make the right decisions. Under the pressure of time spent by the opposing defense on "manual" mode, it's hard to handle, but if it does, you'll have some new options in terms of freedom in the passing game. The innovation is certainly useful, but I think that it will find especially in the professional players online application. The biggest change in scope is the new Longshot mode, the counterpart to the "The Journey" career mode, which has found its way into FIFA last year. Without betraying too much in advance: I've run through the mode twice to see the different effects of the choices you make during this interactive story mode. You take on the role of Devin Wade, a quarterback who played for the Texas Longhorns at the University of Texas. In the story you'll be accompanied by "Dev" and his childhood friend, Colton Cruise, who has discovered the role of the wide receiver. The two football crazy guys join together in a regional Combine Scouting and are behind ACHTUNG SPOILER part of the TV series "Longshot". This also gives the mode its name. Devin Wade is "casted" with three other candidates as a quarterback, going through various stations - his friend Colt Cruise turns on the story quite often. The story takes an emotional and makes the player before one or the other difficult decision - each time under pressure you have mostly two answers / options to choose from. In part, the cut scenes are a bit lengthy for my taste, but you could have spent a little more time on the various elements of football in story mode. In principle, you are experiencing a kind of film that you can direct (at least in part) with your decisions every now and then. On the positive side, there are also exercises in which you must recognize certain positions in the field, such as safety, in the role of Devin. This feels authentic and gives a deeper understanding of the sport. ATTENTION SPOILER Pity I think that there are probably three different ends - but you can only see each end, if you play through the entire mode again - or smart stores. Here, EA would have e.g. at Telltale, where there are subdivisions in episodes - to facilitate replaying with different variations. Also, the fact that after the draft aprupt is over and you do not get any chance with Devin or Colton to really start the NFL career is a bit disappointing. EA has certainly left room for the coming Madden parts - you can be curious. All in all, Longshot mode has captivated me to the console, through the complete, replaying but also nerves cost. EA has laid a great cornerstone here, which will certainly expand and improve in the future - for a single play through the mode, except for the really premature ending very successful. You really feel like you're in a football story here, and with the more up-to-date football-related drills, even the Combine at the beginning, the whole thing looks authentic. Also new this year is the MUT-Squads mode. In this mode you grab two friends and play together as 3 Man Squad Online against other teams, if you do not have two buddies on hand, there is also a matchmaking mode. One player is the Captain of the Offense, one player is the Captain of the Defense and the third player assumes the role of Headcoach. The Offense Captain brings the offensive personnel and the Defense Captain the defensive personnel into the game. The head coach brings uniforms and stadiums - an ideal role for beginners. In the Madden Ultimate Team (MUT) mode, the Solo Challenges will again be available this year to help you with the challenges you need to complete to create Coins / Packs etc. for your MUT team. For me, the challenges are always fun and just for beginners, I think they are a good way to stay in Madden. only a quarter played or a touchdown is needed. The Skills Trainer, who teaches you the basics of offensive and defensive play, and familiarizes you with Madden NFL 18 control, also helps you get started. In addition, you get here the various run concepts and coverages closer, interesting for people who look football, but have never come under the tactics. In franchise mode, not much has happened this year, but the base for this mode is still in good overall condition due to the size of previous years with the move function of a franchise. I think it's a pity that in the player's career, for example, you do not have the chance to recreate Devin Wade or Colton Cruise from longshot mode, and thus you can not start a playing career with them. If you want more updates, please keep eyes on u4gm.com which is the most reliable online game store to offer amounts of cheap Madden 18 Coins online.